DEERFIELD-- Most New England historians agree that the 1704 Deerfield Massacre, in which 48 of the town's 300 settlers were killed and 112 were taken hostage, was a defining moment for the town and western Massachusetts. But what isn't commonly known is that the 300 settlers expected the attack. A few hours before the sun rose that chilly February morning, a company of 48 French soldiers and 200 American Indians raided Deerfield--then the farthest northwest settlement on the British frontier, encroaching on French Canadian territory. The invaders came more than 300 miles, mostly by snowshoe, to plunder Deerfield, which was defended by only about 20 militia men. They burnt down houses, slaughtered livestock and one of their prisoners was minister. "It was the most dramatic attack of any New England settlement," said Donald R. Friary, the executive director of Historic Deerfield. The massacre was a hot topic for discussion in Boston and London, he said. "It put Deerfield on the map. If it hadn't been for that, Deerfield would have been just another New England town." The 295-year-old letter anticipated the massacre six months before it occurred and pleaded for support from the south. Indeed, many a book has been written about the massacre and the settlers' grueling 300-mile trek north, which killed about 20 of them. In those books a number of writters have gone into detail about the sense of fear and foreboding in town. Bust last week, Historic Deerfield acquired a 295-year-old letter from Christie's Auction House in New York that makes it clear the settlers knew they were about to be attacked. The letter anticipated the massacre six months before it occurred and pleaded for support from the south. have thought it or duty to lay this matter before you with the fears of hazzard that we are under," Partridge wrote. The aged letter, which cost the museum $7,475 was sent to John Winthrop, then governor of Connecticut. It tells Winthrop that two different groups of friendly Indians had warned Deerfield settlers about the coming attack, and asks him to send 50 to 60 militia men. Partridge went to Connecticut officials because the towns in western Massachusetts were dependent on Connecticut for military support. "The understanding was that Connecticut would help western Massachusetts since invaders would have to go through Massachusetts to get to Connecticut," said Kevin Sweeney, a history professor at Amherst College who is writing a book on the 1704 attack. And as Friary's recent research has shown, Winthrop responded just two days after receiving Partridge's letter. Friary found Winthrop's response earlier this month at the Massachusetts Historical Society. In his letter, Winthrop said he would dispatch 50 dragoons, or foot sol- diers. The Connecticut soldiers arrived about a week later and, after finding no Indians, decided to go home, Friary said. The French and Indian fighters waited until winter to make the attack, however, which was a surprising tactic since Partridge himself expected the attack in the summer. The attack, a part of Queen Anne's War which ended in 1713, was one of a series of raids along the northern frontier by the French. The idea was to wear down England by making it expend resources defending all of its exposed settlements, Sweeney said. The letter comes from the Henry Ford Museum in Dearborn, Mich., in which it hung unknown to most New England historians. Christie's of New York told the museum that the piece would be auctioned. Before purchasing it, Friary looked over the letter and hired a rare book and manuscript expert to authenticate. "It is in excellent condition for a document of that age, and also Partridge's handwriting is very legible," Friary said, adding that there was no uniformity of spelling in those days. "It simply didn't matter to people." Besides heralding the coming invasion, the letter also shows that the English were in touch with Indi- ians, Friary said. "They were giving intelligence to the English. We tend to think of the relationship with the Indians as one of warfare, but obviously there was communication," he said. And while the massacre was important to Deerfield's history, it was not the only attack on the frontier settlement. 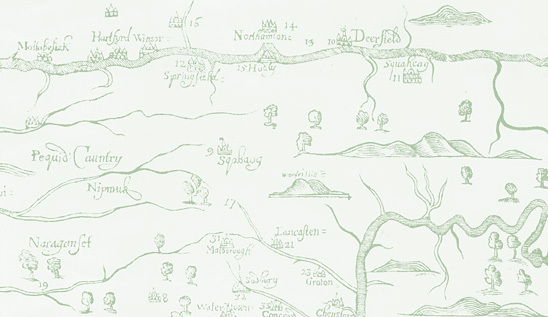 During the King Philip's War, South Deerfield saw about 64 men killed in the 1675 Bloody Brook Massacre. There was also the 1694 attack during the King William's War, a smaller one in 1709 and yet another in 1746. After withstanding such a spree of attacks, Deerfield developed a strong sense of identity and history, Friary said. People began collecting artifacts and eventually institutions like Historic Deerfield and the Pocumtuck Valley Memorial Associ- ation formed. The 1703 letter written by Samuel Partridge to Connecticut Gov. John Winthrop warning of a French and Indian attack on Deerfield. The French and Indian fighters didn't attack until winter, however, and the troops had left. To buy the letter, Historic Deerfield used money it raised from selling other items in its collection. One of the museum's most significant buys was in 1997, when it spent $300,000 on the silver from the First Church in Historic Deerfield. "We have about 30,000 items and each year our curators carefully comb the collection for certain items we could sell to acquire others like this letter," said Grace Friary, director of public relations for Historic Deerfield. "It's an unusual find. First of all it survived, second it is so germane to Deerfield, and third of all it shows the care of this enlisted man," Mrs. Friary said of Partridge. Not only did Partridge plead for help from the Connecticut governor, he was also one of the first militia men to come to Deerfield's aid after the attack began. Seeing the smoke and flames from Hatfield, Partridge and a group of British soldiers headed north and arrived at Deerfield a few hours after the attack began, Friary said. Many of the attackers were "fireing houses & killing all they could that made any resistance; alsoe killing cattle, hogs, and sheep & sakeing & wasting all that came before them Except some persons that Escaped in the Crowds, some by Leaping out at windows and over the fortifications," Partridge wrote in his account of the battle. The relief fighters pushed back the attackers. About a dozen Indians and four Frenchmen were killed, and more than half of the French were injured in the ensuing fight. Eventually, the French soldiers and Indians fled with their prisoners. Partridge and his men chased them as far as they could, but had trouble moving through the three-foot-deep snow without snowshoes, Partridge wrote. Of the 112 prisoners, about 20 died during the walk north. Later, about 60 of the prisoners were ransomed and returned to New England, and about 30 remained in Canada. Half of those married French Canadians, and the other half married into the native community, Sweeney said. The letter will be on public view for a limited time in the fall at Historic Deerfield's Flynt Center of Early New England Life in Old Deerfield. Because of the letter's fragile state, however, it will be stored until 2004, when it will be included in an exhibit commemorat- ing the 300th anniversary of the attack on Deerfield.